Studies on how to maximise the biofuel supply chain have overlooked a key factor  selfishness, say researchers. University of Illinois scientists have created new computer modelling that takes into account competition between the biofuel and food markets and between farmers. With rises in the amounts of biofuel produced, especially corn-based ethanol, the battle for feedstock between grain for agriculture and refineries has become more fierce. The question how best to use farmland is vital for energy and food security and sustainable practices. Previous studies have overlooked the vital factor of the selfishness of farmers and the biofuel sector that each search for maximum profit. 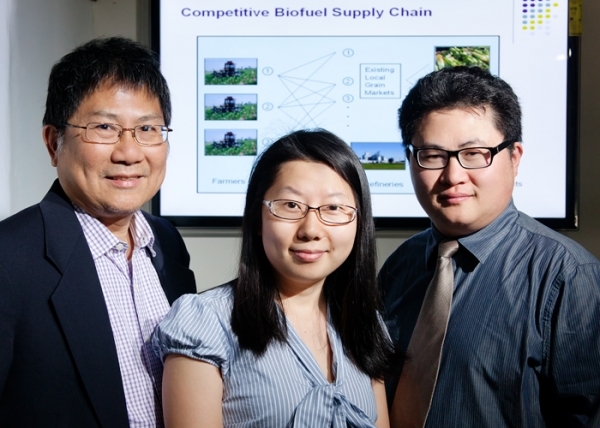 University of Illinois civil and environmental engineering professor, Yanfeng Ouyang, says, "A lot of researchers now working on biofuel supply chain optimization have not been able to develop a holistic model that can address such complex interactions among multiple stakeholders in a comprehensive framework." The study, Biofuel Supply Chain Design Under Competitive Agricultural Land Use and Feedstock Market Equilibrium, has just been published in the Energy Economics journal and backed by the National Science Foundation. Previous research supposed that farmers make their decisions together or cooperatively, but the Illinois researchers believe individual farmers fight for a share of the market. They can choose to sell to the food or biofuel markets, or a mixture of the two, depending on transportation costs and profit levels. As biofuel and grain refineries have limited capacity and price ceilings, farmers are battling with each other to be able to sell. Head of industrial and enterprise systems engineering and at Illinois University Caterpillar Professor, Jong-Shi Pang, says, "The amount sold to the market determines the price on the market, which in turn influences everyones production. Thats the kind of decision-making problems that all the players have to resolve." The university team, student, lead author Yun Ba, Jong-Shi Pang and Yanfeng Ouyang used data from the production and sales of corn to create computer modelling, which was applied to different business scenarios. The researchers applied the models to various business scenarios; for example, farmers cooperating with the biofuel industry through farmland leasing or acquisition. The estimated improvement in overall system profit can provide guidelines for how much effort stakeholders should invest to achieve such business scenarios. The modelling offers principles to get the most out of the biofuel supply chain, the best place for bio refineries and how capacity affects profit. It also took into account pay and location issues for farmers. The modelling can also be used to quantitatively assess how farmers and prices are affected when a biofuel supply chain comes into the market. They found that diverting some of the corn crop to ethanol affects food prices to varying degrees. However, the overall system welfare improved, with farmers being the primary beneficiaries. The team believes that competition benefits farmers, as they have alternative markets with additional bidding options. The trio plan to develop their models to include the impact on the environment changes in production and the rotation of crops.